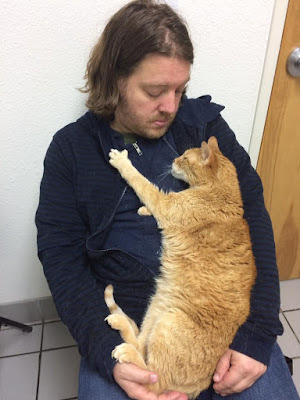 his orange cat in a vet's office. Folks I'm sorry about the absence of a post today and likely some serious jazz hands to end out the week. My cat is not doing well. I found her today unable to even descend her little kitty stairs because she kept, for lack of a better description, "listing" to the right and falling over. At first I thought it was just old lady cat clumsiness and helped her up, but then she did it again. I tried to get her straightened out but she just fell over again. She can't really even stand up. Her legs on her right side just sort of keep failing. Four hundred dollars I don't have later, I know only that her blood looks pretty okay for a cat who has progressing kidney disease. (So it's not kidney or liver failure.) And she is mostly blind due to some retina damage. Not a lot of answers, but we ruled out some things that would be causing her pain. Two current theories are that the kidney disease may have made her throw a clot that caused a stroke and some neurological damage (which sounds like it's right out of an episode of House MD to me). She might get better if that's what's going on. And with the blood work looking good, she may have a little time left. The other is cancer. A brain tumor is also a likely fit for the symptoms. That, of course, won't get better. I wasn't going to give a 17 year old cat a MRI just to rule out a tumor, so I was sent home with some meds and I get to play palliative care cat nurse and watch her closely for signs of improvement. If not, or if it gets worse, I have to think about her quality of life and level of suffering. After watching her fall over on one side this afternoon and not even be able to walk, I thought I was coming home alone today, so this is about the most hopeful news I could get. But it did eat up the whole day including my writing time, and I imagine the next few are going to be touch and go. I'm sorry for what you're both going through. I have been in your shoes. I'm so sorry to hear about your sweet cat. Her declining health must be hard for you to watch. But how lucky she is to have you there with her, caring for and worrying about her. Being a caregiver is a heavy load to carry, that's for sure. Best of luck. There are just no words for this Chris. Those of us who love our cats are with you, holding our kitties a little tighter tonight. Chris, this picture speaks volumes about the bond you two share. Thank you for gifting us with it. All strength for the days to come. So sorry. Sounds like my Spot at age 18. Then she had a seizure, so we made the hard decision (vet said the seizure likely indicated a brain tumor). Best wishes for the meds to help your kitty cat. Glad she has a caring person to look out for her. Oh, I’m so sorry. Our animal friends are so precious. Peace, love and strength to you. Ugh. No words for how much this hurts. Hugs to you and your old sweet cat. I'm so sorry to hear about your cat. I am glad to hear that she has a loving, caring human, and I know that regardless of however long she may or may not have left, her final days will be filled with warmth and love. Don't underestimate the power of the bond you two share, or the power of that bond to bring peace to both of you. I'm sorry to hear about your cat. As a fellow cat lover, I understand how painful this time must be for you. I wish you well and hope that your cat recovers. Keep in mind that 17 years is a good run for a kitty and that you are doing your best to give her even more time. I have had to make the hard choice a few times for my own cats and I agonized over making the decision. However, I can reassure you that you will know should it become time to let her move on. Hugs to you and your cat. I've been wandering through some of your facebook posts and followed the link about your cat here. Sorry to hear, it's always hard watching them get older (I'm typing around the 17 year old crotchety cat on my lap now). I tossed a few pennies in the tip jar - hope it helps some. Thank you so, so much. It does help. I have been where you are and I do not envy you. My cat started to fall over and it would last for half and hour, then she'd be fine. She was almost 23 so I knew that it was the beginning of the end, but not the end yet. We had several quality months together. I hope your kitty is better at the time of my writing this. I miss my girl profoundly. Sending you strength and peace, and a huge snuggle to your cat. One piece I have written I titled "Today Was The Reason I had First Said No." It was about the day I had to again say good bye to a loving feline friend. Sad to hear, but there's hope. Animals can recover well from strokes just like people, so good luck to you and your cat. I found this through your Facebook page and it came at the right time for me. My boy was diagnosed with feline leukaemia yesterday and it's comforting to know that we're not alone. 17!! Wow, what a long happy life! You're both in my prayers. St. Francis would say, Well done!!" Peace. Sorry to hear your news and am hopeful that you get longer with her. Myself and my own Ancient Orange are thinking of you both. I'm so sorry. There's nothing like the love for and of a pet. She beautiful. My heart is with you two. So sorry your kitty's not well. I know from experience how sad this is. Take care of both of you. So sorry to hear about your kitty. Hope she gets through this and you get some more time together! My thoughts are with you, Chris. Sick feline friends need our love. From another orange tabby companion.